The call for including humans as components of ecological research is not new. As we described in Chapter 1, the obvious negative impacts of human activities have been well documented, but the more subtle causes and effects of humans on ecosystems have not traditionally been the subject of study by North American ecologists. Similarly, human populated areas are typically not considered within the research domain of ecologists. Ironically, however, the very first paper published in the Ecological Society of America’s journal, Ecology, was on the influence of weather on infection rates of pneumonia and influenza in the citizens of New York City and Boston (Huntington 1920). 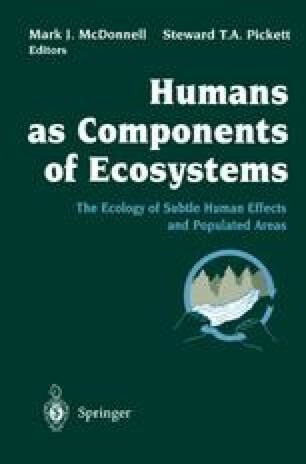 Since Huntington’s paper, there have been relatively few studies that include humans as part of an ecological system published in the journal. The relative lack of ecological research that includes humans may reflect a long-standing tension in ecology (Kingsland 1985) between historical and instantaneous approaches.